Biologists and “Citizen Scientists” in the Comox Valley have banned together to gather data on an elusive creature that has long been a metaphor for the fears of mankind. Through scientific names like lucifugus (Latin: flees from the light) and noctivagans (Latin: night wanderer), the mystique of the bat bridges the occasionally antipodal worlds of culture and science. Dracula vs. Batman: vampires are a mythological European demon, more akin to the modern-day zombie that rises from the grave to feed on the blood of the living. Bram Stoker’s Dracula was the first cultural connection between the concept of vampires and bats. When Dracula was first published in 1897, the connection was formative only. Dracula could also take the form of wolf, mist, or “elemental dust”. However, in 1924, when Hamilton Deane wrote a theatrical adaptation of Dracula (later revised by John L. Balderson), the black cape and emphatic reference to bat iconography established the ethos of the contemporary vampire. While it’s true that some species of bat feed exclusively on the blood of mammals, the aptly named vampire bat makes up only 0.0025% of the bat species on earth. Most bats eat bugs. Some eat fruit. Bram Stoker’s interpretation of the vampire did to Halloween what Coca-Cola’s interpretation of St Nicholas did to Christmas. In 1939, the iconic image of Batman moving through the dark streets and skylines of Gotham City was created by Bob Kane and Bill Finger for DC Comics. In stark contrast to Dracula, this nocturnal hero defeats evil and upholds the values of civil, democratic society. As the sun begins to set, I prepare for the night ahead. I check the status of the lunar cycle and the low temperatures forecasted for nighttime. Probability of precipitation? I connect ultrasonic microphones to iPads and data loggers. Are the batteries charged in the FLIR thermal imaging camera? How about headlamps and flashlights? As most people climb into bed, I walk out into the night. As dusk falls I approach one of Cumberland’s historic mine ventilation shafts. The ultrasonic bat acoustic recording device goes berserk. Within the first 15 minutes I record the vocalizations of seven of the nine species of bat which are native to Vancouver Island. The emergence of bats from their day-roosts is a phenomenon to behold. For now. 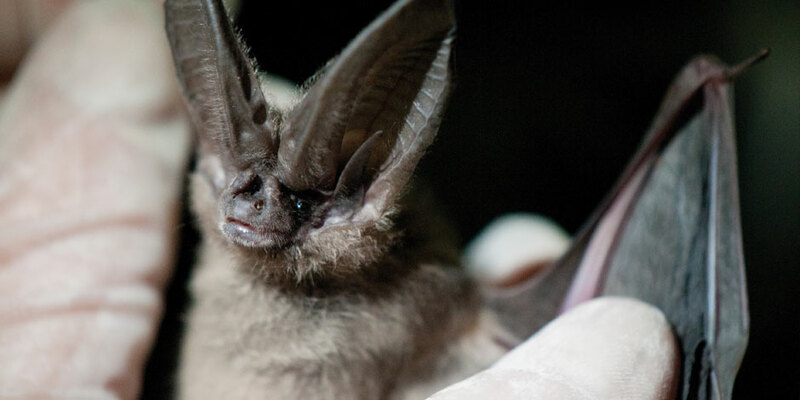 Unfortunately, an introduced fungus known as White Nosed Syndrome (WNS) is decimating certain bat populations from eastern North America westwards at a rapid rate. It kills 98% of bats in the area it strikes: a near complete eradication of a species. This led the Government of Canada to emergency-list our most common bat species (Little Brown Bat – Myotis lucifugus) as endangered. WNS has yet to reach Vancouver Island, but it has reached Seattle. As WNS advances, I can’t help but wonder if I’m witnessing the last healthy generation of Little Brown Bats in the Comox Valley. Will our grandchildren ever see one in their lifetime? The chances are slim. Finding the cure for WNS is a race against time. Little Brown Bats eat one and a half times their body weight in mosquitoes almost every evening. What will happen when these bats are gone? The sad truth is that there’s very little science-based data about bats of any species in coastal BC. We have no information on where they hang out in the day, where they rest at night, where they prefer to locate maternal colonies, whether they migrate south or hibernate here, or where key winter hibernacula are located. We know more about the moon than we know about the most common mammals in coastal BC. The newly minted Cumberland Bat Collective intends to change that. 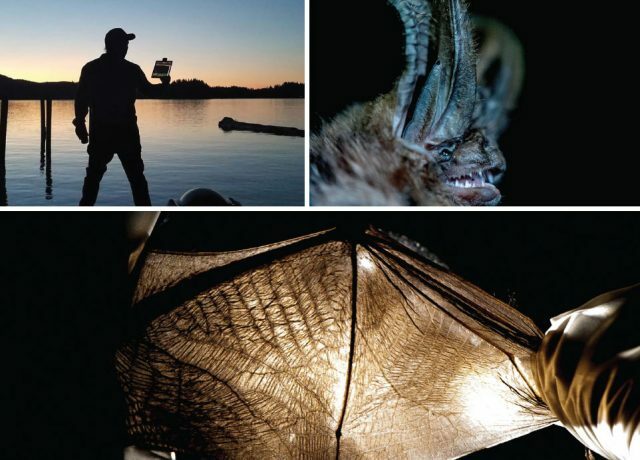 This group of stalwart biologists and “citizen scientists” of the Comox Valley go out into the night to record the ultrasonic sounds of bats. We are then able to develop a basic understanding of which species are where when, and in what densities. This and other data we collect contributes to a North American-wide network of like-minded and concerned individuals who have started monitoring bats from Mexico to Alaska. Through this “dark science” we hope to shed some light on the mythological and enigmatic species of the night that is central to our quality of life in the Comox Valley.